At night it is very agile, using its grasping claws and tail to climb. 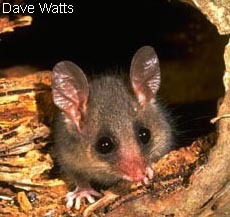 The Eastern Pygmy Possum is wary and scurries about in quick jerky movements. In winter, when food is scarce, the Pygmy Possum conserves energy by becoming torpid for much of the day. Pygmy Possums are found in Habitats ranging from rainforest to woodland and heath and are reasonably common. Head and body: 7-11cm Tail: 8-11cm Weight 24 grams The pygmy possum does not make much noise except when provoked when they may hiss loudly During the warmer part of the year, when food is plentiful, Pygmy Possums accumulate body fat and the base of the tail becomes swollen and carrot-shaped. 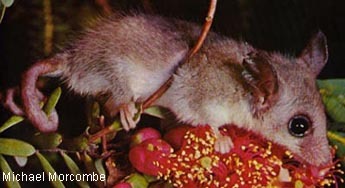 Unlike other burramyids, the Eastern Pygmy-possum feeds mainly on nectar and pollen, obtained from the flowers of a wide variety of trees and shrubs (especially "Banksias", Bottlebrush and Eucalypt blossoms) by means of a long, brush-tipped tongue. Insects and soft fruits are also eaten. In winter when food is scarce a pygmy possum spends time in a state of "torpor". 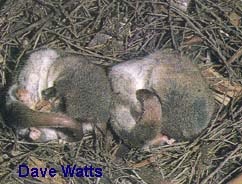 The possum curls up in a tight ball with its ears covering its eyes and its nose tucked into its chest. In this state the pygmy possums body temperature drops to almost the same temperature as the air around it thus conserving energy, as it does not need to eat and drink in this state ! 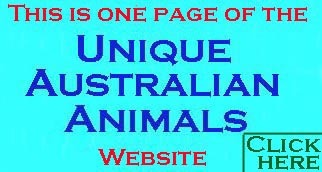 The breeding season for the Eastern Pygmy Possum is from August to April and two litters are usually raised in a year. The female has four or five teats and usually raises four young. When they become too big to be carried in the pouch, the young Pygmy Possum remains in the nest until weaned at the age of about two months.